With Wimbledon and the World Cup wrapping up last week, it was a sporty ten days at the Lodge. Our guests have treated each day like grand final day and left nothing out on the paddock. 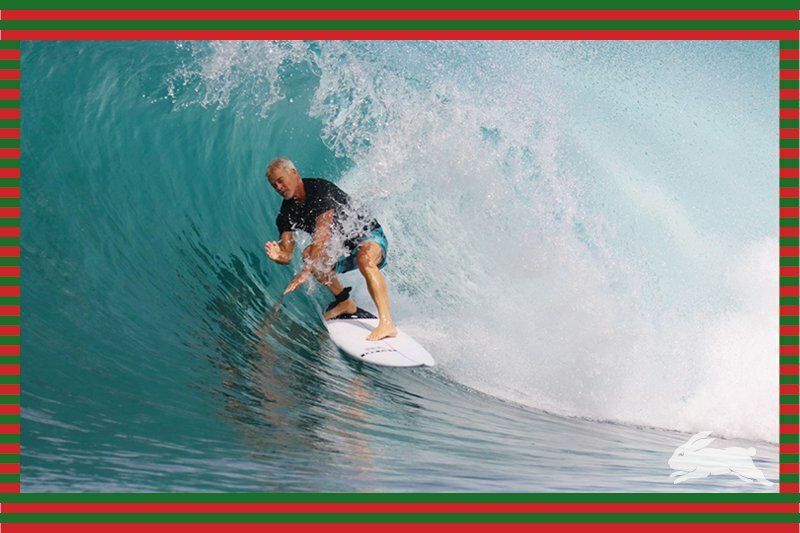 Of course you’ve got your football where sooks writhe around grabbing their ankles in pretend agony, and you’ve got your REAL footy – which brings us to John Tatam – number one supporter of the South Sydney Rabbitohs Rugby League team, (in who’s colours we theme this special surf report). Accompanying his old boy John is Matt (The Rat) Tatam who loves the Rabbitohs as much as his Dad. Matt’s a signwriter who’s also a champion lawn bowler. Mona Vale’s finest. He’s a solid surfer who throws buckets and isn’t scared of the tube. Like his dad, Rats is a fun bloke who enjoyed getting on the beers, but unlike his dad was always keen for the early. Gary Laubach is a life coach from San Clemente, who’s working on a book to be released later this year called ‘Real Lessons, Real Life’. Gaz specialises in hard hitting honesty and will have you in stitches while at the same time questioning your place on this earth. Dinner time or a lull between sets is always entertaining with Gary holding forth. This smooth goofy footer prefers Max’s Left above all other breaks. Some people confuse Gary with a veterinarian of the same name, but rest assured this is not him, so no questions about your that mysterious lump on your dog’s chest OK? Paul Jablon’s a software developer from Laguna Beach, California. Not knowing the rest of the crew, Paul was a bit reserved but as always happens at The Lodge, those reservations melted away after a few days. Paul’s trip highlight was his first barrel at GTs. A few of the boys snuck off super early one morning with guide Dingo and scored. Sadly we missed the photo but Paul has the view from the inside forever imprinted on his memory. He’s a fit bugger who loves his stretching and yoga classes back home, and was stoked to have Sami, our resident yoga instructor help him stay loose and enjoy countless hours of water time. Paul’s son Luc is a mellow 15-year-old on land who turns into a frother in the water, throwing down man sized turns and also charging GT’s. One memorable session, Luc got hammered into the reef a few times, but instead of paddling back to the boat, stayed out ‘til he was the last one in the water and only came in once he’d nailed a meaty one. Says a lot about the young bloke, who also ruled the table tennis table. Anyway, you’ll see from the photos that we scored great surf!